TICONDEROGA, N.Y. — Sunbury Press has released Perilous Journey: The Two Faces of Benedict Arnold, the late Ted Brusaw’s historical novel about the Revolutionary War accomplishments of the controversial general. Few Americans are as controversial as Benedict Arnold, whose name is synonymous with treachery and treason. 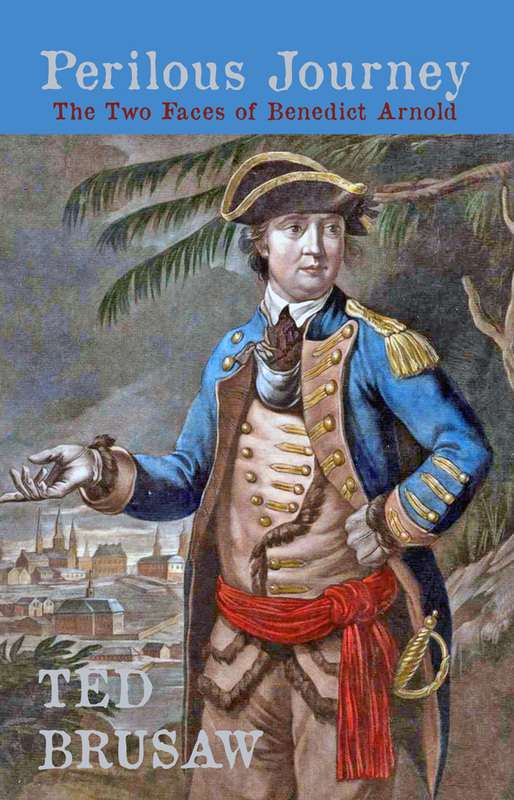 Arnold was one of the heroes of Fort Ticonderoga, who later became frustrated with the pace of the Revolutionary War and the politics. At a time when all of the patriots were under threat of death for raising arms against the British crown, he caved to the pressure and flipped sides. Ted Brusaw recounts these events with historical accuracy, adding depth and detail only achieved in a novel. Still wearing the uniform of a Massachusetts militia colonel, Benedict Arnold returned the salute of the sentry outside General Washington’s headquarters and entered the building. Pausing to allow his eyes to adjust to the relative darkness, he was surprised to see that General Washington’s headquarters looked remarkably like all the mercantile establishments he had seen during his many years as a merchant. It was crammed with writing desks and tables heaped with documents. Papers were even stacked on the floor, leaving hardly enough space to walk, and officers sat at the desks scratching away with quill pens. In the fireplace, a small blaze kept a kettle of tea hot. Arnold recognized General Horatio Gates, General Washington’s adjutant general, from descriptions he had heard around army headquarters and campfires. Gates was a squat man of fifty who peered through thick spectacles out of a beefy, red face. Slightly stooped with straggly hair, he looked more like a fussbudget of a schoolmaster than a general. In spite of his appearance, however, he had a reputation in the army for being bluff and hearty with soldiers. “How are you, Colonel Arnold?” Gates responded, rising and extending his hand. Gates returned twenty minutes later and escorted Arnold to the inner sanctum of the commander-in-chief of the Continental Army. General Washington stood to greet him. Washington was in his early forties, a man of commanding presence who stood 6′ 2″ and weighed perhaps 190 pounds. His reddish-brown hair was tied in a queue at the back of his head, and wide-set blue eyes looked out from a face that had been scarred by smallpox. Defective teeth showed when he smiled. “Good day, Colonel,” he said, looking down slightly at the 5′ 8″ Arnold. He motioned to a chair. “Please have a seat and tell me about yourself. Are you married? Do you have children?” Arnold’s proposal to march to Quebec through Maine’s stark wilderness intrigued Washington, and he wanted to size up the man before determining how seriously to take it. Arnold took the offered seat and looked up at the still-standing Washington. Washington seated himself opposite Arnold. “Please accept my sympathy for the loss of your wife. So you are from Connecticut, but you wear the uniform of the Massachusetts militia?” Washington’s brows rose slightly to turn the statement into a question. Charles “Ted” Brusaw (1931-2015) graduated from Clarksburg High School (Clarksburg, IN) and served in the Air Force for four years. Ted graduated from Miami University (Oxford, OH) and retired from NCR (Dayton, OH) in 1986. He was the co-author on many text books and had three novels published.